The work is wonderful and in this season of Christmas everything will be good. Here in Perdoes we are working here to bring soul unto heavenly father. We are having some difficulties finding people, but we are receiving a lot of references from the members here, references boas. We taught a young man yesterday who is a friend of a returned missionary, he accepted baptism and we will be teaching and working with him to baptism him in two weeks. One thing that I am working on is making those relationships of trust and friendships with investigators and with the members. As a missionary you really have to show joy and a positive attitude to inspire and lift those around, members, missionaries, investigators every one. How did thanksgiving go, and Acea's birthday, here In brazil it does not feel like the Christmas Season, it is hot and rainy. Almost every day we have some short of rain fall and with this hot climate you can really feel the heat. I am feel like I am lacking snow but I am glad I don't have to shove for two years. I have a question are the Elders still living in our house or because of the downsizing of elders in the ward our house wasn't needed? I have a question. I found a man here that repairs the church Buildings here near Campinas, I first ran it to him in June my first Area, and a I bumped into him again, and he said that he had a Companion whose name was Elder Hainsworth from Spokane Washington, I said I will ask a few people to see if Brother Hainsworth served in Curitiba Brazil. Could you ask him if he remembers having a companion named Elder Feliciano? That would we pretty neat if it was indeed him. I have found out that I might be able to use Skype on Christmas Eve that Saturday to talk to you but I will make sure and let you know, can you send me anyways what I need to know to use Skype? Thank you for the Happy Thanksgiving, I hope you have a good time with eating turkey, and the apple and pumpkin pie. HAPPY BIRTHDAY ACEA, FELIZ ANIVERSARIO!!!! You will be 16 years old, and that means you can get out there into the world and date all of the righteous young women que alegria. This past week has been great, a little difficult but great. We are starting almost from scratch, the other elders left a few good people that we are preparing to be baptized but we are slowly building up our teaching pool. 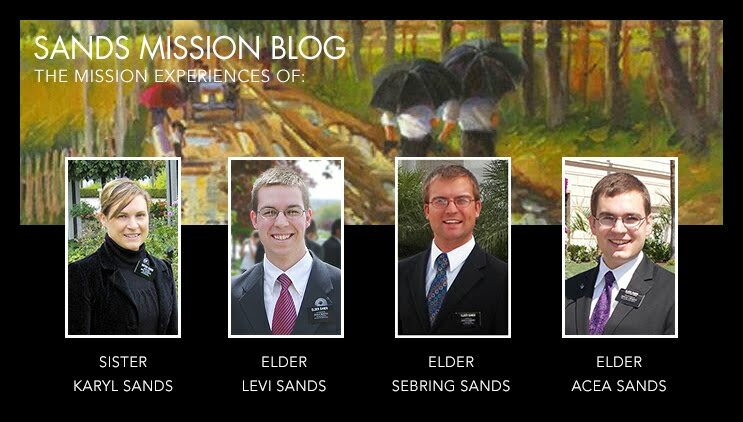 The members here are wonderful, they are the most excited and helpful members that I have known on the mission, because they want to help, they want to build up the branch, we have been given many references of friends and family which helps with the integration of present converts to always stay active in the church. There is one thing that I am learning from Elder Cunha and it is to be excited, to really be excited for the work. He is always jumping with joy and shares that joy with everyone and especially with the members, the members need to be your best friend and we help them see the vision of the Branch, but with every goal we need to have faith and not doubt. One thing I want to say but don't worry too much, we have a rat living in our house. He comes and goes through a little crevice in a door and we got a good look at him on Monday. I took a video which really shows the size; about 8 inches, just pray for us that we can kill him without any problems. We had transfers this week and us both were transferred, I was transferred to perdões an area close to my second area of Itatiba. My new companion is Elder Cunha he is wonderful, he is really excited to work and we will have miracles here in perdões. We are opening an area and the two elders that left didn’t really leave anything for us, no information of investigators, no information about the area, but we found out the members are really excited to work and almost begged us to let them work with us, and that is what we are going to do, the work really can’t move forward much without the missionaries and the members working together, giving references to the missionaries, making friendships with investigators, etc. I am glad you are worried for me but don’t worry I gave that story to show how much Elder Coelho has helped me grow and really become successful. And I have overcome a lot of weaknesses with teaching, working in the Field, planning, all types of thing that are need to become senior companion. Your question you asked last week or two about Halloween here in Brazil, it is not the same thing with the gathering of candy at every door, it is only parties because it is part of the American culture they have adopted, but Stores sell costumes which are used for parties. I am glad that life over there is wonderful and I am really seeing the blessings of the Lord in your lives, and I am glad to see Ben almost ready and I know this is the will of the Lord because of the accident. I will make a video but this time in Portuguese; it is a lot easier and you can use the gift of interpretation of tongues. Just kidding, I will make a video and help him really do his best to get out on the mission, hey who knows maybe he will come here in Campinas Brazil. Those pictures of Acea are very good and I think the bottom one you took in the sink with the spoons and forks, hey you could come here and take all of my pictures that would be really good. I am glad you can see a change in me, it is sometimes hard to see it in yourself because you also see all of you weaknesses. A few weeks ago we had a companionship inventory which we just talk about things we can do better. Like I said before, the purpose the Mission President put me with Elder Coelho is really to speed up the progress to get to ready to be senior companion, and in that inventory he let it all out, all of the weaknesses. I was almost a the point of a breakdown of confidence because I knew what he said was true and that I need to change, but with the help of the Lord I am overcoming these weaknesses and they are becoming strong. We are having a lot of miracles here in São Manuel, at first we weren't having much success, but with the help of the Lord we are finding, teaching, and baptizing the elect. Last Saturday we had a wonderful wedding were the wife was preparing to be baptized with her daughter, and that night we had a beautiful baptism were two choice daughters of Heavenly Father entered the waters of baptism to further the happiness and piece that has changed their lives. We are preparing a young woman this week and next week two more, a dad and daughter will be baptized. One thing I am learning is when we do our part the Lord will always do his part, when we do all that we can do the Lord will do all that he can do. It's great that you liked the DVD, that has all of the pictures I took up to two weeks ago, If you have any questions or want to know the story behind anyone just ask. I did a little digging about Christmas, If I stayed here in São Manuel I found Skype access but I will have to see if I will be transferred into another area or not. Thanks for the uplifting encouragement I am learning a lot and learning how to really overcome my weaknesses as a person and as a missionary. My companion (Elder Coelho) is the best, he has taught me more things than my trainer taught me, not about learning Portuguese or learning how to do the basic teaching or techniques but really to speak well, teach with power, and work effectively to find, teach, and baptize children of our Heavenly Father. It has been hard but through the Lord my weaknesses are becoming strong. This Saturday we will be baptizing a mother and Daughter after her wedding. The wedding and Baptism of Marsia has truly been a miracle, it has be challenging to track down all of the documents required, countless hours of waiting for the Bus, and overcoming every obstacle the enemy has put in our way, but you can feel the love the happiness in the lives of this family and with baptism starts their journey to return with God again and that makes it worth it. Things are looking up in São Manuel with the help of the members and the cloud of distrust, hopelessness, defeat is starting to dissipate and the light of the gospel and the missionary work is starting to shine through. An interesting story for you, on Sunday we were making our way to an area in São Manuel a little far, and on the way two ladies going to church stopped us and asked us to check to see if a man that was sleeping on the side of the road was dead. We went and find out he was drunk, very drunk. We helped him up and walk to a park to site and rest and with him was half liter of liquor, my companion asked for it 3 times and finally he gave it to us and right now we have liquor in our apartment, but don't worry we will trough it away where it belongs. If anyone wants to know anything just ask I will be glad to answer.